There is an increasing trend within the metal shredding industry to be proactive to environmental concerns and states such as California are leading the way in increased oversight and regulation of the shredding industry. The auto recycling industry is becoming highly regulated in the United States by government environmental regulatory agencies on the federal, state, county and municipal levels. 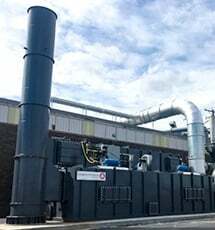 Air pollution control in metal shredder facilities has historically been focused on the containment of metal shredder residue (MSR) utilizing filtration technology such as cyclones, baghouses, scrubbers, as well as suppression technology such as water or foam injection. While these technologies are effective for containing particulate matter (PM), they are not sufficient to control the harmful volatile organic compounds (VOCs) which can pass directly through these systems and into the atmosphere. The metal recycling industry has matured and grown during the past several decades. Specifically, the recycling of end-of-life vehicles (ELVs) and other obsolete consumer products has become a well-established industry with many economic and environmental benefits. While the net environmental benefits of recycling ELVs may be clear, it is important to recognize that the recycling process is not without environmental concerns. With such growth also comes increased regulatory pressures and public scrutiny. A "metal shredding facility" is an operation that uses a shredding technique to process end-of-life vehicles, appliances, and other forms of scrap metal to facilitate the separation and sorting of ferrous metals, nonferrous metals, and other recyclable materials from non-recyclable materials. Metal shredding operations all follow the same basic process. 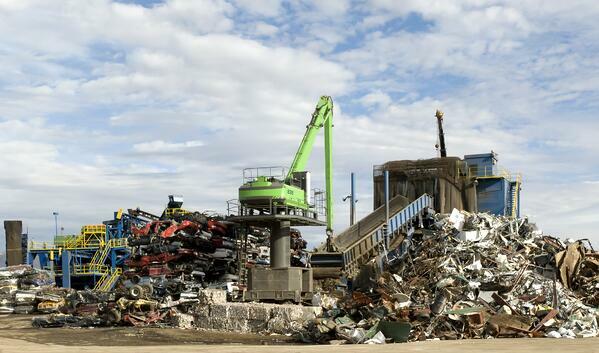 The metal shredding facility receives scrap metal input materials, such as whole vehicles and large appliances. 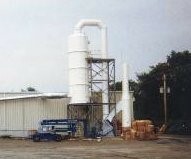 Certain hazardous wastes that are still present are removed from the input materials in a process commonly referred to as “de-pollution.” The de-polluted input materials are processed through a hammer mill to break down large metal pieces into smaller pieces, resulting in metal shredder aggregate. Iron-containing metal, or ferrous metal, is separated out, and the remaining metal shredder aggregate is further processed to sort the non-ferrous metals. The material that is left after ferrous and non-ferrous metal separation is referred to as “metal shredder residue (MSR),” which is chemically treated and sent to landfills. Many existing metal shredder permits cover only particulate matter (PM) and fugitive emissions. As the shredding industry evolves and environmental regulations expand, industry faces new challenges related to the treatment and disposal of metal shredder residue (MSR) and the control of volatile organic compounds (VOCs), hazardous air pollutants (HAPs) and nuisance odors. 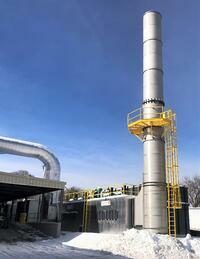 Many metal shredder facilities utilize scrubbers as part of a particulate control system. While some water-soluble VOCs may get captured in the scrubber, these units are not optimized for VOC control, and allow the non-water-soluble VOCs to pass untreated and straight through into the atmosphere. An essential component to any VOC destruction system is the capture of particulate matter and VOCs generated from the shredding process. Direct shredder capture - such as a collection system extracting air directly from the shredder, such as from the discharge hood or the area above the shredder inlet. Partial Enclosure – In some instances a partial enclosure, or hood type enclosure can be implemented above the shredder box or exit locations. Total Enclosure – An increasing trend is to build an enclosure around the entire shredder, ensuring safety, while mitigating noise and ensuring dust, particulate, and VOC capture. An RTO requires a dust-free air stream, so a particulate control system is typically placed before the oxidizer. Any dust containing metal particles or other inorganic material which enter the RTO can form slag or plug the RTO heat exchanger, which reduces performance and can damage the unit. In order to effectively destroy the VOCs liberated during the metal shredding process, specific VOC control technology is required. 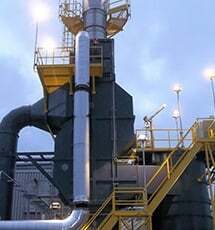 The most common technology utilized for VOC, HAP, and Odor control is thermal oxidization, and specifically a Regenerative Thermal Oxidizer. 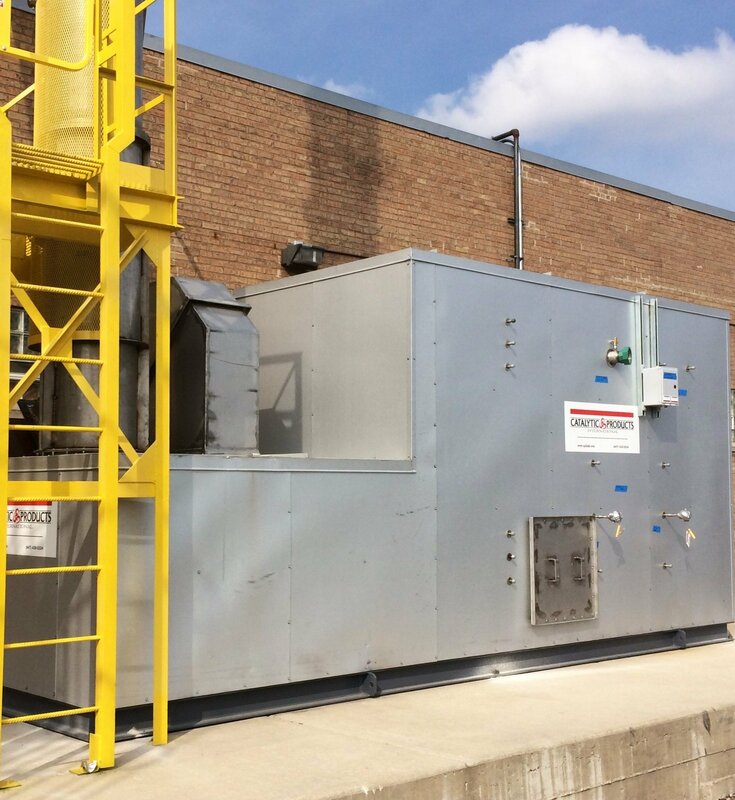 A Regenerative Thermal Oxidizer (RTO) is an industrial air pollution control device utilized to remove VOCs from exhaust air. The RTO incorporates a specialized ceramic media bed which absorbs heat from the exhaust gas. Incoming gases are passed over this heated bed, which destroys the organic compounds through oxidation. Oxidation of VOCs and other air pollutants works by simply oxidizing the air pollutants with oxygen and heat. In this environment the VOCs are converted to harmless inert byproducts like carbon dioxide (CO2 ), water vapor (H2O), and usable heat. These harmless by-products are released to the atmosphere. Any halogenated compounds present in the incoming exhaust stream to the RTO, such as remaining chlorofluorocarbons (CFCs) in vehicle and appliance refrigerant systems, can create acid gasses when oxidized in the RTO. Depending on local regulations, these acid gasses are removed using a wet scrubber at the final stage of the air pollution control system following the RTO. 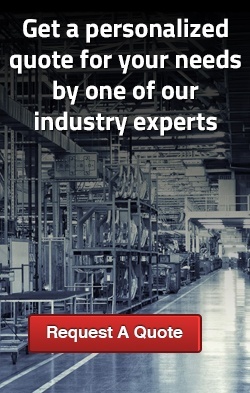 Catalytic Products International (CPI) has been enabling clean production since 1969, and is a leading supplier of air pollution control solutions. CPI is at the forefront in providing industries including the metal recycling industry with solutions to their air pollution control needs. CPI partners with its customers as a trusted resource in resolving the most complex air pollution and energy conservation problems. We provide our customers with innovative and cost-conscious solutions to their most complex VOC, NOx, and Odor pollution challenges. Our equipment is also at work meeting energy conservation strategies and minimizing greenhouse gas (GHG) emissions.